It has been proven many times over that a human biological cell does not have to be exposed to ionized (nuclear) radiation solely for it to be adversely affected by a human-made toxin. There are plenty of reputable peer-reviewed studies showing that various chemicals and materials, as well as non-ionizing (human-made) radiation, can have disruptive effects on biological cells. With more than 4,000 scientific experiments and epidemiological studies conducted around the world, non-ionic electromagnetic field radiation has been proven to be harmful with prolonged exposure. Regardless of any study, there has never been a single study that observes the cumulative effect of many layered clusters of electromagnetic fields from various bands of the EMF spectrum, synergistically working together to effect a human being over a prolonged time, except for the epidemiological study that all of us have been participating for many generations. For the medical profession as a whole to not be focusing on electromagnetism and the consistencies to every disease known to our modern world has to be questioned. Someday, Quantum Biology will be taught in medical schools. A little common sense science is desperately needed, today. What makes a chemical reaction but the comings and goings of electrons? What causes a cell to relinquish electrons and reverse its polarity? Fortunately, for all of us, there is a growing number of top medical doctors who are taking notice of the consistencies between the growing electromagnetic levels in American homes and the growing numbers of diabetes, heart disease, neurological disease, cancer, infertility, thyroid disease, depression, suicide, violence, and more. Look deeper than social media and video games. Look deeper than diet and exercise. In 2016, the Swedish Government ranked cell phone radiation as a Group 1 Toxin along with cigarette smoke, uranium, and asbestos. In 2017, the U.S. Department of Health National Toxicology Program released that 2G and 3G caused malignant shwannomas on the hearts of male rats and malignant brain gliomas in some, as well as other problems among mice and rats. Read. Do you not think that 4G LTE and 5G are not electromagnetism? You could be fine one day, but because of the cumulative affect of prolonged exposure to strong electromagnetic fields, you could suddenly present toxicity symptoms. Some people present an allergic-like reaction, known as electrohypersensitivity (EHS) or EMF Sensitivity. Yes, it is similar to chemical sensitivity. Often those with a chemical sensitivity are also overtly sensitive to EMF. The published studies that claim to debunk EHS are riddled with poor scientific methodology. A non-ionizing electromagnetic field is typically the radiation emitted from power transmission lines, solar panel, wind turbine, and hybrid car induction converters, cell tower transmitters, WiFi routers, mobile phones, smart meters, all wireless devices including bluetooth, stray neighborhood voltage, fluorescent and CFL lighting, and much more. We have seen that an atom in a biological cell does not have to an electron detached, by ionic radiation, in order for a cell to lose electrons. A non-ionizing source of magnetism can effect the spin of an electron and its orbit. Stress on a cell will cause it to give up electrons. If AC Magnetic Fields can penetrate well below the surface of an ocean (10,000 feet), then they can well penetrate into you. MRI imaging utilizes this science. Our New York City poses a unique electromagnetic field (EMF) environment. Because of our dense population, EMFs present an over-lapping accumulative morphological effect found in few other places in the world. There have not been any health studies conducted to account for these kinds of profound accumulations of electromagnetism. Measuring and understanding these "EMF Super-Fields" require highly experienced city-based EMF testing skills. Unfortunately, few New Yorkers are aware of their own EMF output. Cell phones can be much more invasive inside a subway car, elevator, or bus; due to the hard reflective surfaces. Apartment building Wi-Fi, cell towers, and smart meters can create hundreds of signals encroaching from 360 degrees. Wiring errors can create strong AC magnetic fields. We will often encounter a "perfect storm" of electromagnetic fields in a sickly person’s apartment. In Europe, cell towers are required to be placed no closer than one kilometer from each other. A kilometer equals 0.62 miles. Manhattan is 22.82 square miles or 36.75 square kilometers. In 2013, there were 14,000 mobile phone base stations. Below is the 2007 map of approved antenna permits. Today, based on the location and number of cell transmitters in my neighborhood, one could deduce that these 2007 numbers have been exceeded. If this were a European city, we'd have about 37 cell towers. On the map above, there's too many to count. To add, just on the Upper West Side we now have cell phone kiosks on every corner up and down Broadway and Columbus Avenues, and cell transmitters in the subways. 5G antennas are popping up everywhere. Will someone please send us the health studies proving this new set of frequency bands planned to be broadcast en masse will be safe for human consumption? 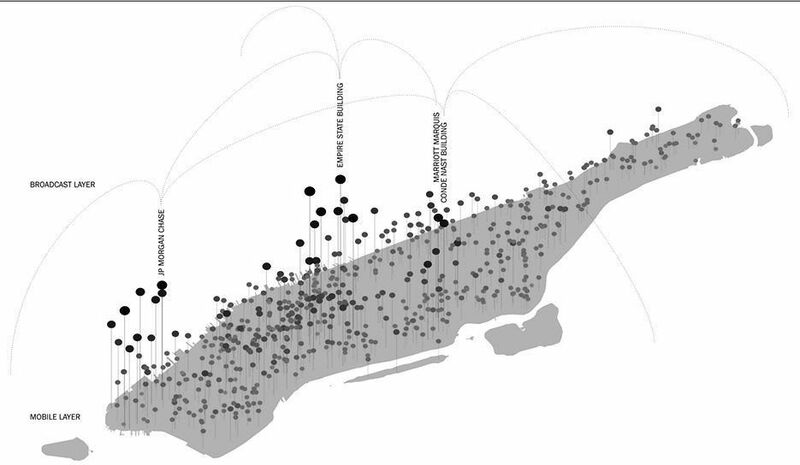 Here's another Manhattan cell tower map. Most of us have a cell phone, wifi in the home, cordless telephones, bluetooth appliances, Alexa, baby monitors, bluetooth keyboards and mouses, smart meters, and more. Add to this, a power company that apparently doesn't monitor leakage with a gauss meter, and too many poorly trained residential electricians creating wiring errors that are causing high EMF in nearly half of all homes. It is no wonder most homes have a self-created EMF issue. This is a typical occurrence in Manhattan. 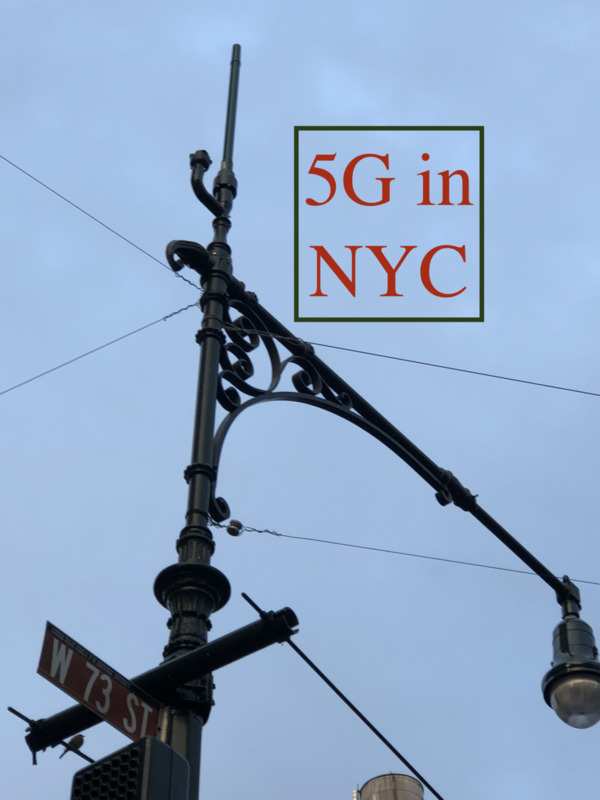 Notice the 5G antenna on top of this this iconic lamp post on Columbus Avenue. 5G antennas are spaced out about every 100 yards. Planck’s Law states that the higher the frequency, the higher the energy. Considering that there has not been a long-term exposure testing for 5G and that the National Institute of Health found 2G and 3G to cause cancer, we New Yorkers may be grinding our teeth even more. Electromagnetic Interference (EMI) occurs when High Frequency Communication Signals couple onto electrical wiring and semi-conductors. This is the reason why you are asked to place your cell phones in “airplane mode” when you are about to take-off or land in an airplane, or upon entering a certain hospital wing. If EMI can interfere with the functioning of electrical equipment, how is it effecting the electrical connections in the brain? Is there a causal link for those who are depressed, anxious, aggressive, and confused? It's not unusual that we find multiple cell tower transmitters entering an apartment from the four directions, at any given time. We often measure the microwave energy in apartments on the 9th floor and above as exceeding the safety limits of France, Germany, Russia, Switzerland, and others. As mentioned, cell towers are placed much closer than European safety regulations. What is ELEXANA or Electron Health? Every chemical reaction is a result of the coming and going of electrons. The electrons in every biological cell provide the spark that sustains and gives us life. When AC fields couple with our body’s DC field, the electrical circuits on our skin experience EMI electromagnetic interference. With our Galileo Protocol™, we measure this phenomenon. Often, it’s an increase of up to 60 KHz (that’s 60,000 Hertz) and beyond! Add a strong AC voltage to the skin from handling a charging iPhone (about 6 Volts), an electric bed (about 7 Volts), or placing a charging laptop on your lap using a 2-pronged plug (near 40 Volts!) and the 1,000-100,000 Ω (ohms) resistance of the skin quickly becomes violated by this biologically unnatural force. The internal resistance of the body is about 300 Ω. So, once beyond the epidermal and dermal layers, these AC currents bringing high transient frequencies can travel to wherever they can locate a negative charge. (Electricity flows from positive to negative.) Yes, that’s potentially any healthy cell or organ! We believe that the best start to healing from any illness is to reduce your exposure to EMF, electromagnetic fields. At ELEXANA, this is just one reason why we are so passionate about our work. insomnia, auto-immune disorder, inhibited calcium ion signaling and motility, leukemia, lymphoma, brain and nervous system tumors, acoustic neuroma, melanoma, breast cancer, breast cancer medications rendered ineffective, neurological disorders, autism, fatigue, dry eyes, compromised blood-brain barrier, leaky gut syndrome, premature cataracts, tinnitus, an uncomfortable feeling of heat, or pressure inside the head, migraine headaches, low sperm count, low sperm motility, female infertility, miscarriage, birth defects, chromosomal breaks, suppression of DNA mechanisms, DNA mutation, mitochondrial dysfunction and damage, sensitivity to noise, damaged placenta, burning or tingling skin sensations, short-term memory loss, confusion, concentration problems, brain fog, neuronal damage, nausea, vertigo, accelerated heart rate, high blood pressure, high triglyceride levels, heart arrhythmia, ADD, ADHD, learning disorders, depression, fibromyalgia, obeisity, chronic fatigue syndrome, adrenal failure, unexplained rashes, muscle weakness, muscle pain, mood swings, irritability, slow reflexes, weak immunity, and more. * Prolonged exposure to strong EMFs will generally accelerate most cancers and neurological diseases. This book is packed with scientific studies proving the harmful effects resulting from EMFs. Robert O. Becker gave up his career as a researcher to become the first EMF awareness activist. Please, fill out the form below and one of our staff members will get back to you. Thank you.